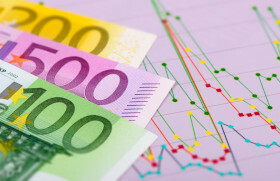 The euro fell against most of its major rivals today even after the German economic sentiment improved unexpectedly. The losses were small for the most part, though. It is remarkable that the ZEW Economic Sentiment for Germany has not deteriorated further given the large number of global economic risks. The financial market experts have already considerably lowered their expectations for economic growth in the past few months. New, potentially negative factors such as the rejection of the Brexit deal by the British House of Commons and the relatively weak growth in China in the last quarter of 2018 have thus already been anticipated. Indeed, experts were anticipating a decline to -18.8. The situation with the sentiment indicator for the whole eurozone was almost opposite as it improved just barely, while economists had expected a significant improvement. The index ticked up from -21.0 to -20.9 versus the forecast figure of -18.8. EUR/USD edged down from 1.1366 to 1.1360 as of 12:25 GMT today, touching the low of 1.1346 intraday. EUR/GBP went down from 0.8813 to 0.8807. EUR/JPY declined from 124.63 to 124.34.